12 Penalty Points will lead to DL Suspension - Learn how you earn them? Hyderabad Traffic Police has started implementing the Government Order passed on 24-April-2017 which has introduced Penalty points in addition to the traffic challan you pay for a violation. These penalty points are applied on your driving license and all you need is 12 Points for your driving license to be suspended for an year. Below is the list the offenses which earn you these points. phone/excess load projection on either side/ jumping signal/lane crossing (zig zag). As you can see from the list above that most aspects that earn you points are for dangerous driving. Once you have earned these points they will be recorded in the RTA database against your DL for 24Months. What happens once you get 12 Points? a. 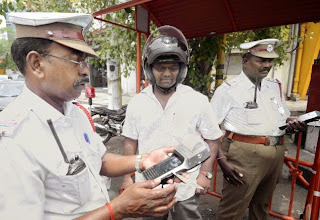 At any point of time, if the cumulative tally of the penalty points accrued by a driver having a license exceeds the limit of twelve (12) points during the preceding block period of 24 months, his/her driving license shall be suspended for a period of one year from the date of accrual of twelve points. On suspension of the driving license, the accrued penalty points shall cease to subsist. b. If a person, whose license has been suspended and later revoked after completion of one year period under Rule 45-A(4)(i), again accrues twelve (12) points subsequently, driving license of such person shall be suspended for a period of 2 years from the date of accrual of the said twelve (12) points. On further repetition of accumulation of 12 points every time, the driving license shall be suspended for a period of 3 years. Driving with a Suspended Driving License? If you are driving with a suspended license then the vehicle will be seized and a chargesheet will be filed in the court. If a person holding a learner's license gets 5 points during the validity period of learner's license, then the learner's license shall be cancelled forthwith. The person whose learner's license has been cancelled shall be eligible for re-issue of fresh Learner's License on production of a certificate of learning driving as prescribed from a recognized school or establishment. How to reduce your Penalty Points? Government has also provided for a way for you to reduce your penalty points. If a person has accumulated several points for violations, he shall get an opportunity to reduce the tally by three Penalty Points by undergoing defensive training course/motor vehicle accident prevention course from an institution recognized by the Transport Department of the Government. However, this facility shall be restricted to two times in a continuous period of two years”. A separate division in City Police was formed at Hyderabad which is called Cyberabad by Legislative Assembly with the passage of the Bill called Cyberabad Act in the year 2004 introduced by then State Government in Power of Chandrababu Naidu, TDP. While the area under Hyderabad Police Commissioner is the core of Hyderabad, Cyberabad has a much larger area though much of it is still under development and is surrounding Hyderabad from all sides. Cyberabad Police limits, includes areas like Madhapur, Gachibowli, Hi-Tech City, Kukatpally, Miyapur, Balanagar, Sanath Nagar, Alwal, Malkajgiri, Uppal, L.B.Nagar,Rajendra Nagar, Saroornagar, Shivarampally etc. Such queries can be sent to DCP (Traffic), Cyberabad at the e-mail address dcp_trf@cyb.appolice.gov.in. 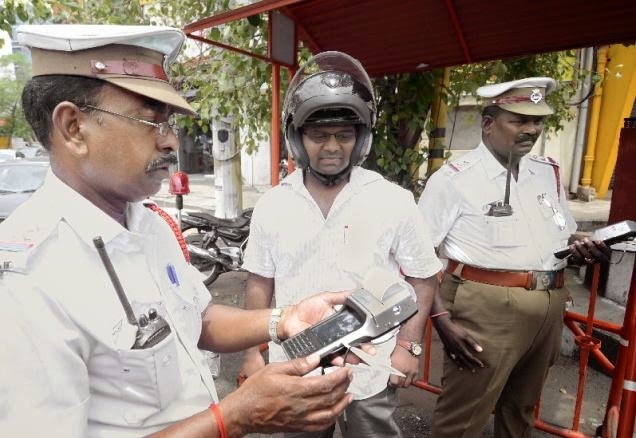 Hyderabad Traffic Police will respond only to queries which fall within Hyderabad Traffic Police limits. Queries pertaining to Cyberabad Police limits, which include areas like Madhapur, Gachibowli, Hi-Tech City, Kukatpally, Miyapur, Balanagar, Sanath Nagar, Alwal, Malkajgiri, Uppal, L.B.Nagar,Rajendra Nagar, Saroornagar, Shivarampally etc. Such queries should be sent to DCP (Traffic), Cyberabad at the e-mail address dcp_trf@cyb.appolice.gov.in.